Limit Rate Signs | Matsui America Inc. 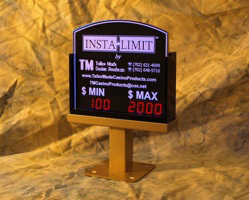 The newest table limit product is the LCD Limit features: 7” screen with 4 segment display, SD card programming, gold, silver or black finishes and our easy-mount system. The Insta-Limit IL5 which is the tall model is also available in a short base. The Push button adjustability on the back of the sign makes a fast & easy change of limits & faceplate color, associating it to the chip denomination. The Insta-Limit IL5 is also capable of scrolling message.